(22 September 2011, Hong Kong) Now in its 11th year, Ocean Park Halloween Bash is embarking on another decade of frightful fun by transforming Ocean Park into the Republic of Halloween. At today’s official launch of the annual event, Dr. Allan Zeman, Chairman of Ocean Park, dressed as a “ghostly” military general, announced that the Park had, for the first time ever, set a new all-time attendance record for a calendar month on back-to-back months during July and August, resulting in a 45% increase over the same period last year. As Halloween Bash has grown to become an event of international significance over the past ten years, guest demographics have also become more diverse. Tourists from overseas and mainland China now account for close to 30% of overall attendance during the Halloween Bash month. Dr. Zeman is confident that attendance during this year’s Halloween Bash will achieve the expected 10-15% increase and approach the 700,000 mark. Dr. Zeman said, “We are thrilled that Ocean Park was able to set a new summer attendance record, which testifies to our leading position in the international market. The opening of Aqua City, the Rainforest and other new attractions has enabled us to attract more guests. 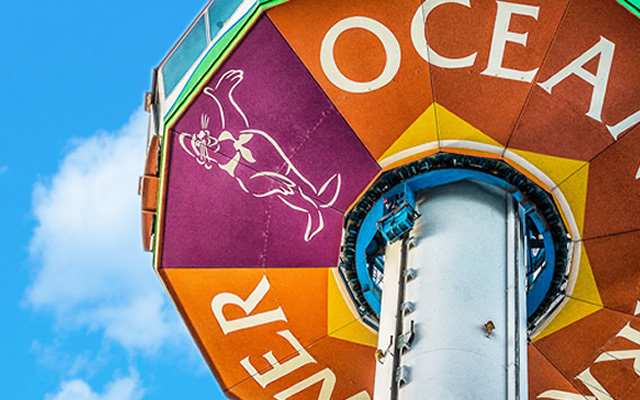 During this past July and August, Ocean Park recorded monthly attendance of nearly 800,000 and over 900,000 respectively, setting an all-time monthly attendance record on back-to-back months, with a year-on-year increase of about 45%. The entire staff of Ocean Park is grateful to all the guests for their support. The Republic of Halloween not only has created eight haunted houses, but also arranged 17 spectacular shows throughout the Park. Guests would not want to miss Carnival of the Damned, the first-ever haunted show on a 360° water screen at the Waterfront. Featuring some 30 fantastic dancers, themed projections, fire effects, powerful rhythms, giant bizarre puppets and a ghoulish parade, this extravaganza is the most exhilarating Halloween party in town. At the summit, guests can find Lady Gwai Gwai and the latest fright groups rocking and rolling as part of the Freaky Party of Halloween Republic at the Summit Plaza. The show features illusions provided by world-renown illusionist Franz Harary, who has worked with Michael Jackson, Janet Jackson and other international stars. There are also gags of all sorts, hot, pounding music and acts as the ghouls outdo each other throughout the night. Now in its 11th year, Ocean Park Halloween Bash has grown immensely since its inception to become the world’s largest Halloween celebration featuring macabre themes from both the East and the West. The number of ghost performers alone has jumped from 39 in the first year to this year’s 444. Over the past ten years, guest demographics has also become more international and diverse — from predominantly local guests in its early days to having close to 30% non-local guests last year. This testifies to the fact that Ocean Park Halloween Bash has become not just a signature event in Hong Kong, but one of Asia’s most renowned large-scale celebration, attended by people from all over the world. Attendance for last year’s event reached 560,000, setting a new record. With a 10-15% increase in attendance expected this year, the 600,000 mark could very well be exceeded on the march towards 700,000. Response to the early-bird discount offer for Halloween Bash (23-25 September) has been phenomenal, with tickets for 24 September already sold out. To enable more courageous souls to take part in Halloween Bash together, Ocean Park is offering group coupons through Groupon and BeeCrazy for Halloween Bash night tickets (for 19 & 20 October) at 40% discount, making it possible for guests to purchase night tickets priced at HK$280 for only HK$168. By sharing their Halloween Bash experience, netizens and Ocean Park fans can also have a chance to win night tickets. Also joining Dr. Zeman and Ms. Judy Chen, who dressed up as a military general and a classical Chinese beauty, at the Charity Night were popular TV stars Michael Tse and Kate Tsui, as well as 444 ghouls. The event signalled the official opening of this year’s Halloween Bash. Moreover, Hidy Yu, Ocean Ambassador for Miss Scuba International 2011, together with eight contestants appeared at Ocean Park to spread important messages about protecting the ocean and marine life. Starting on 23 September, the public will be able to celebrate the inauguration of the Republic of Halloween at Halloween Bash 2011, which features 25 haunted attractions and shows**, 444 ghouls, including superstar Lady Gwai Gwai. The eight haunted houses include: Nightmare in 3D, the world’s first-ever haunted attraction featuring a locally developed 3D projection system; Fear Factory, a solo walk-through journey in a coffin factory filled with terrifying tricks; Macabre Studio; Torture Chamber of the Dragon Empress; Zombie Mayhem; Bloody Workshop; the Paper Doll Paradise and The Last Bus. As well, the Lagoon in Aqua City will be transformed into what appears to be a lake of blood and the 360° water screen will play host to the first-ever Carnival for the Damned. Kids visiting Ocean Park in the daytime during this year’s Halloween Bash period can also share in the Halloween spirit at Creepy Treats for Kids. Tickets for Halloween Bash 2011 are already on sale; early-bird tickets (for 23-25 September) are available at 20% discount, but hurry, as tickets are going fast and the 24th of September is already sold-out. *Please visit Ocean Park’s official website (www.oceanpark.com.hk) for details. **For further details, please see the attached factsheet on attractions and admission.